GroundSwell, our advocacy and community engagement program, grew to over 13,000 supporters in FY2015, bolstered by the launch of a new monthly newsletter to highlight community engagement programs from arts & culture organizations across the region and successful online advocacy action campaigns to protect arts funding at the City, State and Federal levels. The January 2015 GroundSwell Community Engagement Forum was also hugely successful as a professional development event for community engagement workers in the arts & culture sector. On April 22, GroundSwell hosted a Mayoral Forum on Parks & Arts, in partnership with the Philadelphia Parks Alliance. Over 150 arts and parks supporters attended the forum at the Free Library, bringing these quality-of-life issues to the forefront of the 2015 Mayoral race. GroundSwell made some of its biggest headlines throughout spring 2015, when responding to the Mayor’s proposed 40% budget cut for the Philadelphia Cultural Fund in FY2016. The Cultural Alliance and GroundSwell led a successful push to influence City Council to maintain funding for the Cultural Fund, with behind-the-scenes and public advocacy work including the second Philadelphia Arts Advocacy Day on April 7; city budget testimonies; pop-up acts of arts and culture at City Hall; and a #SavePHLArts Twitter campaign. The Cultural Alliance attended the 2015 National Arts Advocacy Day in March, traveling to Washington, D.C. to meet with staff in Senator Bob Casey and Senator Toomey’s offices as well as Congressmen Brady, Fattah, Meehan and Fitzpatrick’s offices. The Alliance collaborated with statewide advocacy partners, led by Citizens for the Arts, to inform Governor Wolf’s administration on a wide range of policy issues affecting arts and culture and the benefits to the Commonwealth. A statewide Arts Policy Lab meeting in April broadened participation and explored important issues for arts education, museums, the film industry, tourism, cultural districts and arts funding. In May 2015, the Alliance’s advocacy and policy leadership traveled to Harrisburg for Pennsylvania Arts Advocacy Day, emphasizing funding for the Pennsylvania Council on the Arts. This October, the Cultural Alliance will release its latest research report, Culture Across Communities. This report is a follow-up and expansion on our renowned Portfolio research on the financial health of the arts and culture sector in Philadelphia, and will be presented as a cross-regional comparison of benchmarks for 10 additional cities across the country. Culture Across Communities is supported by a grant from the Doris Duke Charitable Foundation. The Alliance also produced the 2014 Patron Loyalty Study: Loyalty By the Numbers report, a comprehensive loyalty study that examined patron financial transactions at 17 major attractions over 7 years. One of the most striking findings in the report was the importance of top-level cultural advocates. 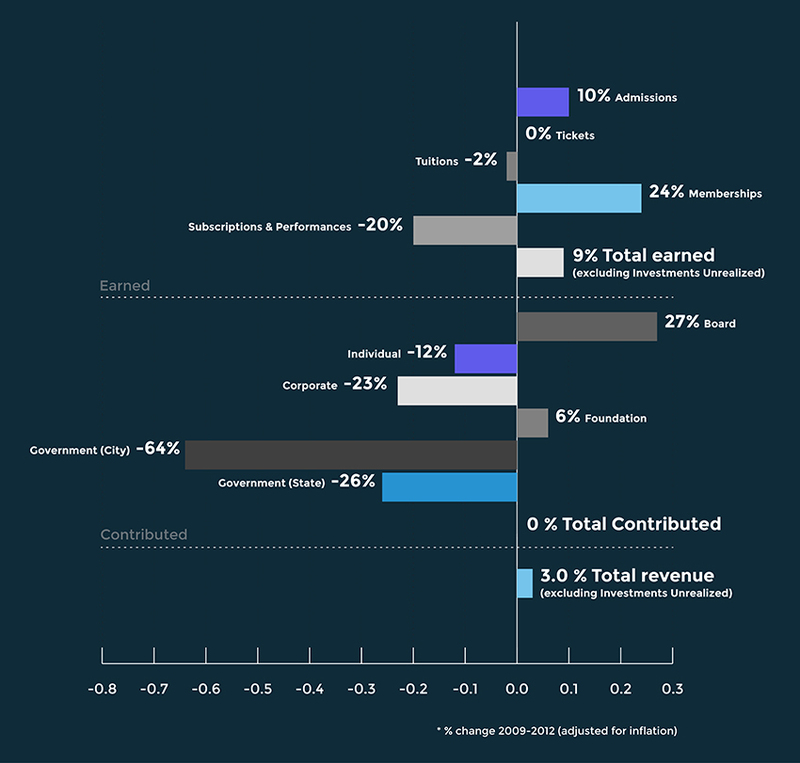 As seen in the graph, Advocates make up only .3% of all patrons, yet generate over a third of total revenue. Another key finding was that the most loyal patrons at individual organizations tended to be the most active patrons throughout the community. The more organizations a patron visited, the more likely they were to be a high-end advocate at one individual organization.